It’s only Wednesday, and for some reason, I woke up more tired than when I went to bed. I feel absolutely exhausted this morning. I just want to crawl back in bed, but I have to go to work. It’s only 14 degrees outside, too. Good day to stay in bed, all warm & snuggly. 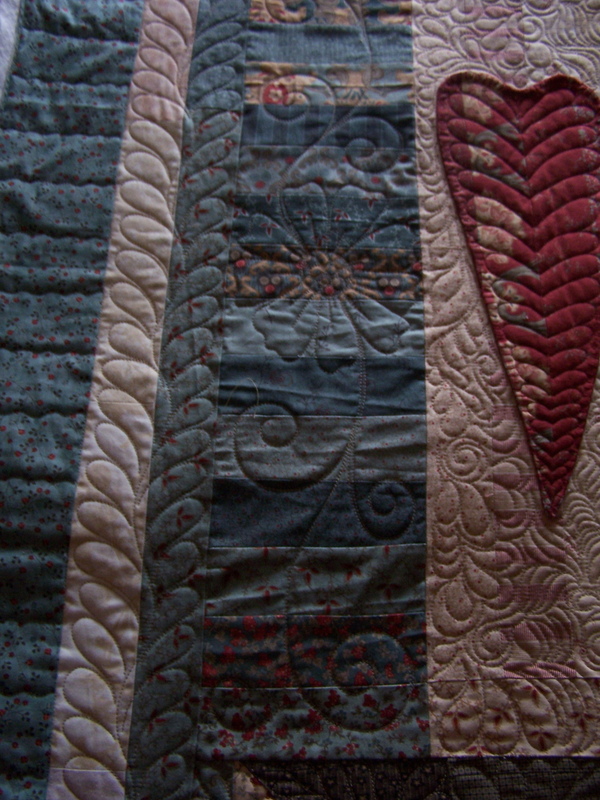 I finished Joanna’s quilt, and it is in the mail on it’s way back to her. Thought I’d share a couple of pics right quick. 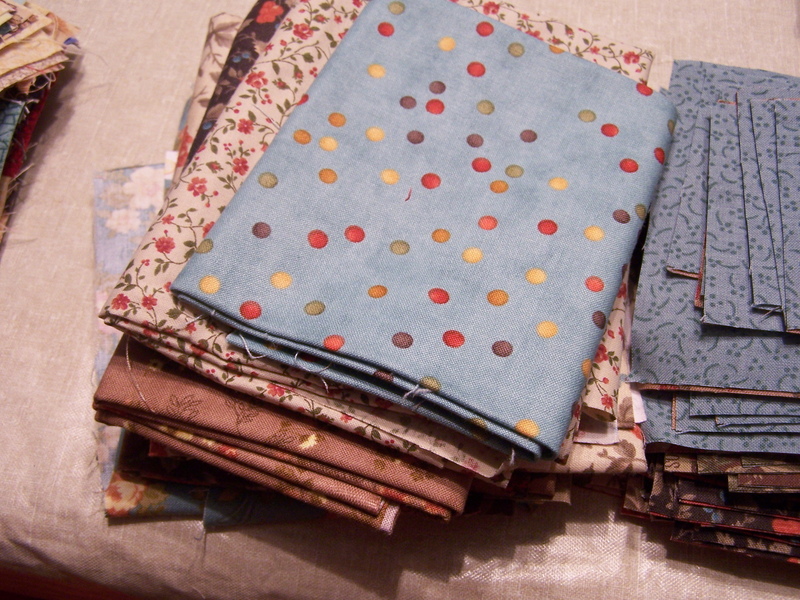 This week my fabric busted is gifted fabric. 3 yards for a birthday gift to a guild member, the one who gave me that awesome reindeer ornament, and another 3/4 yds. to another recipient, and another 1.5 yds to another recipient. But the last two don’t know it yet, so I won’t say who. 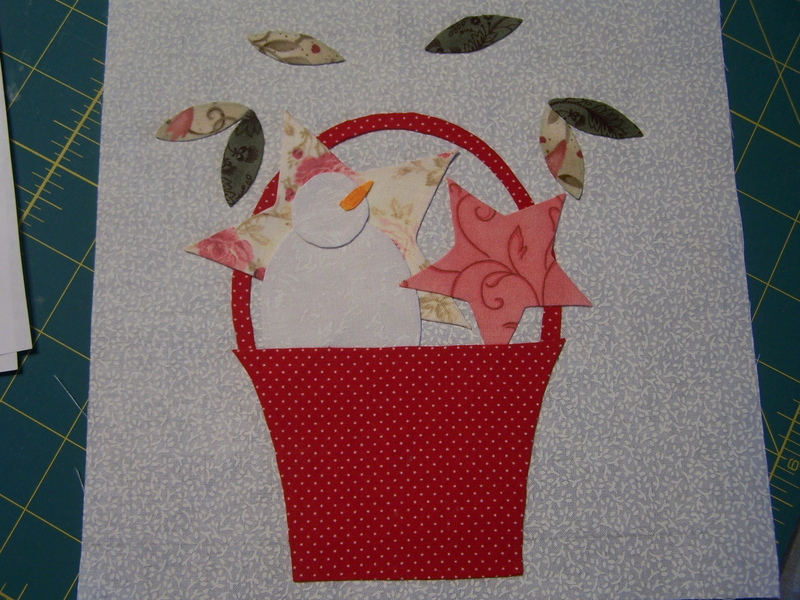 I did start that little applique block of the month, but I haven’t figured out how to count that yet. 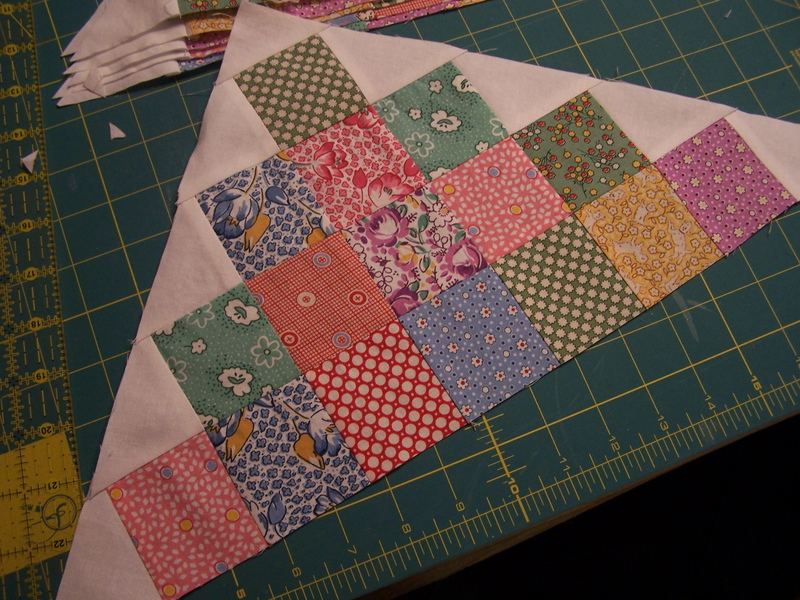 I had to use bits of two fat quarters, but the rest I am using scraps. 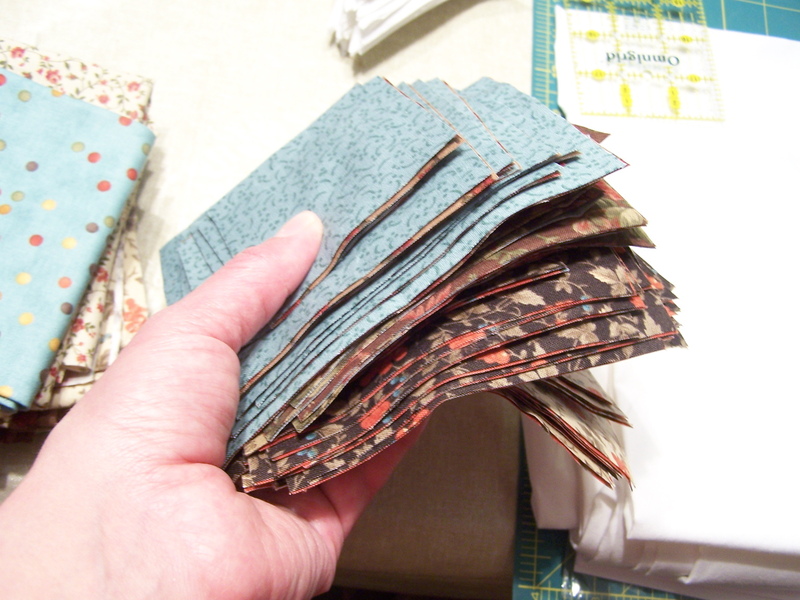 I have a feeling I will be using the rest of those two fat quarters in the project, but will know more when we get the next block. If I use more of them, then I will count them as busted, in a later report. At least they are off the shelf. I have made some more progress on the stash projects I started right after Christmas. 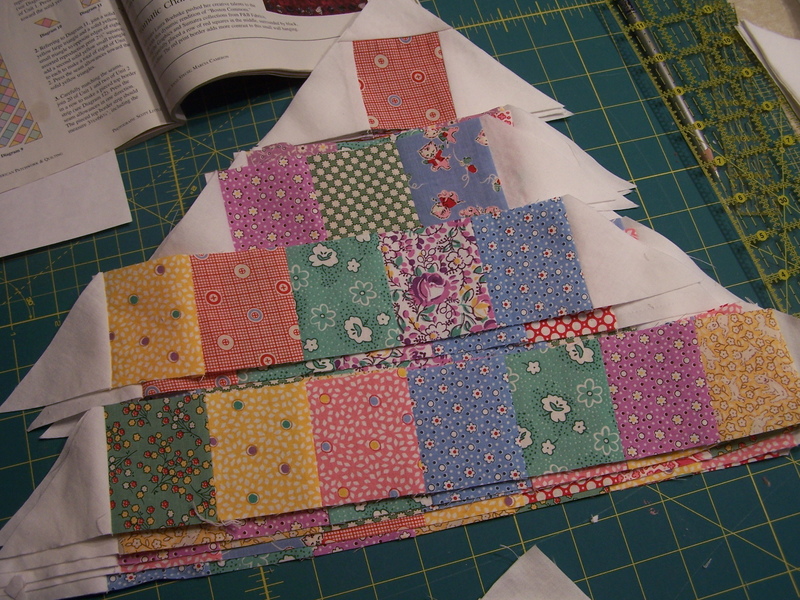 I cut up some more of the fat quarters for my Gracie’s Star, and they are all ready to sew into blocks. I have these left to cut up. I cut my Kona white into these. Started sewing them onto these. I had to go ahead and sew one corner together, just to make sure it was going to work. I’m really enjoying my time spent working with these fabrics. I love them! 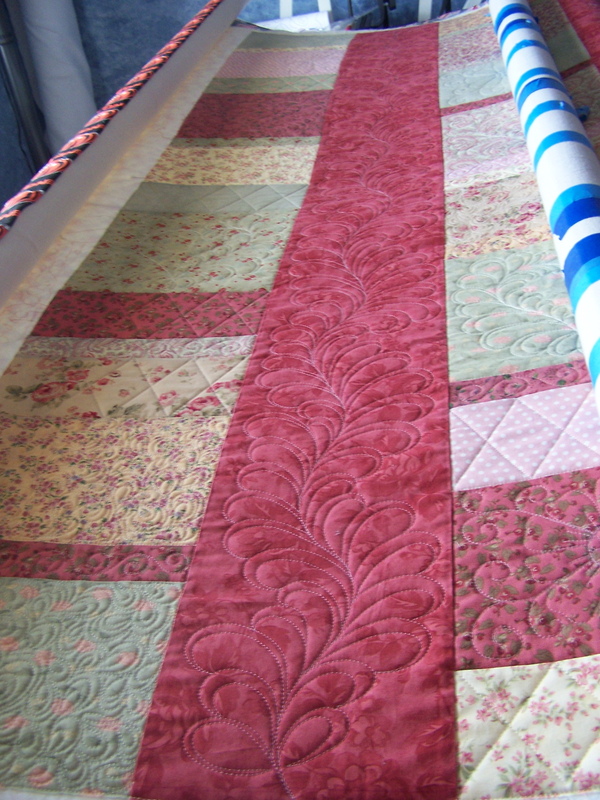 I hope to enter this quilt in some shows. At least some smaller, local area shows. And I may even get brave and send it somewhere like MQS next year, to get some judge’s comments. We’ll see. 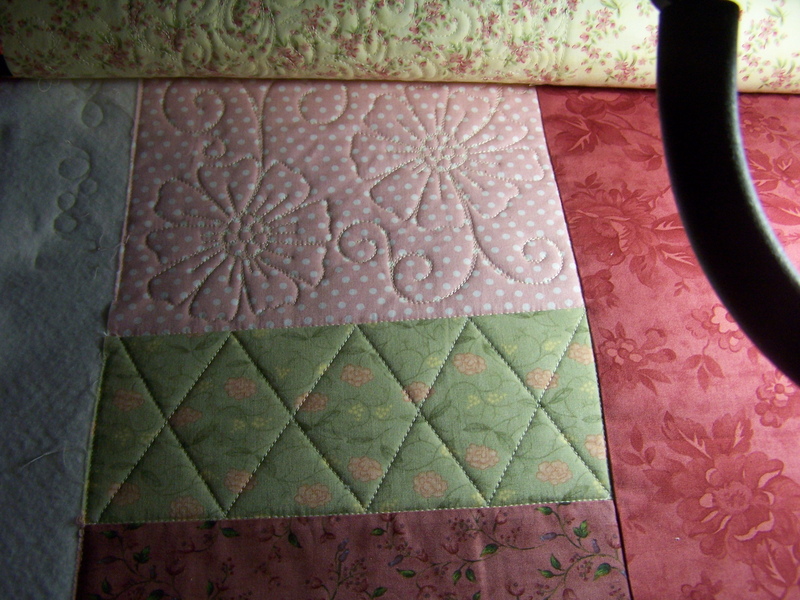 Finally, I’m to the part of Joanna’s quilt that I have been looking forward to quilting the most! The looonnnggg feathered strips. Oh yes! 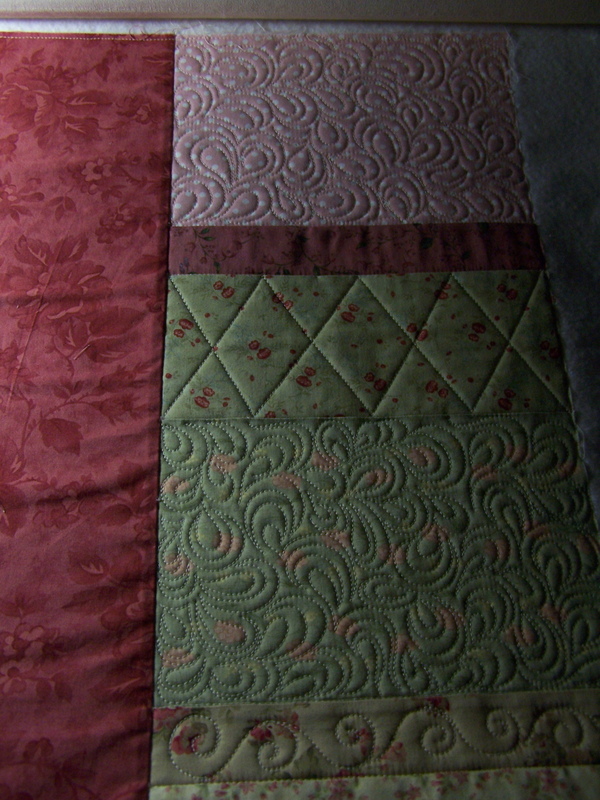 I think our quilting plan has come together nicely. I started a little basket. Lord knows I needed another project to work on right now, so he made sure I stumbled across this one from Bunny Hill Designs…lol. 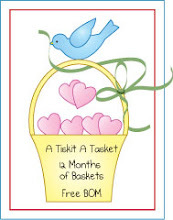 It’s called a Tisket A Tasket, and it’s a free block of the month. Applique is really a struggle for me, so mine may not get any further than this, but I’m going to try. Just one a month. We’ll see. That tiny little carrot nose almost did me in. I am using the Sharon Schamber applique method, which involves a stabilizer under each piece and lots of washable Elmer’s glue. Right now, glue is the only thing holding mine together. Also, there’s the issue of the hand embroidery that has to be done. Not sure how that is going to work out for me. Succeed or fail, I will keep you posted! But isn’t it a cute project? 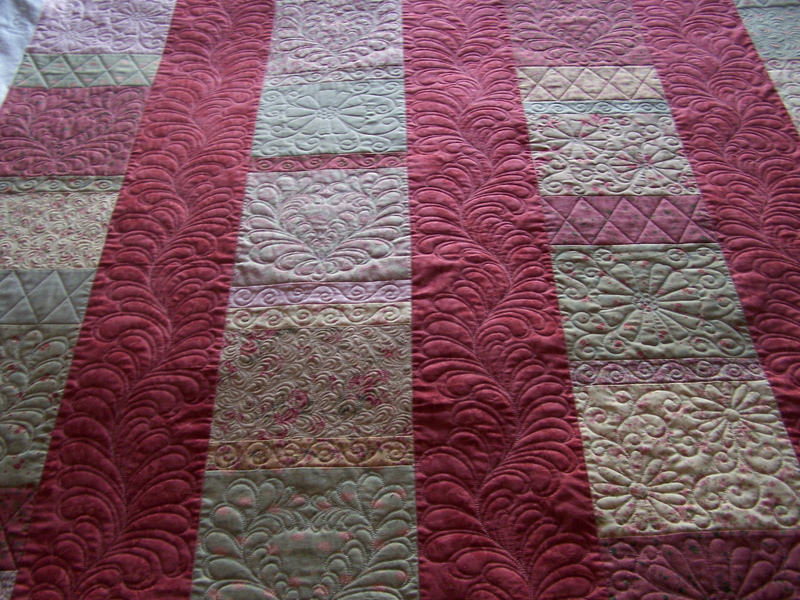 I am still quilting on Joanna’s Five & Dime. 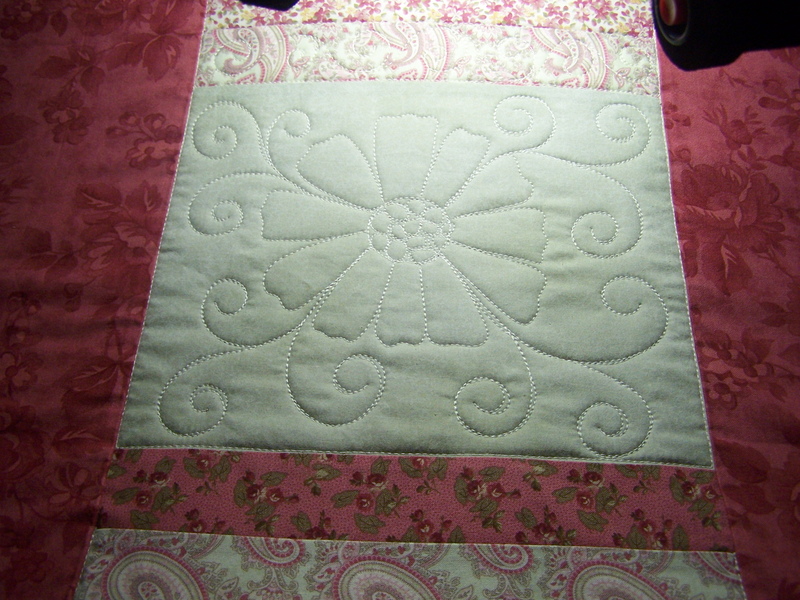 I have one last paisley/peacock filler block to finish with the lighter thread, and then I will finish the flower blocks. I have the swirlies done. 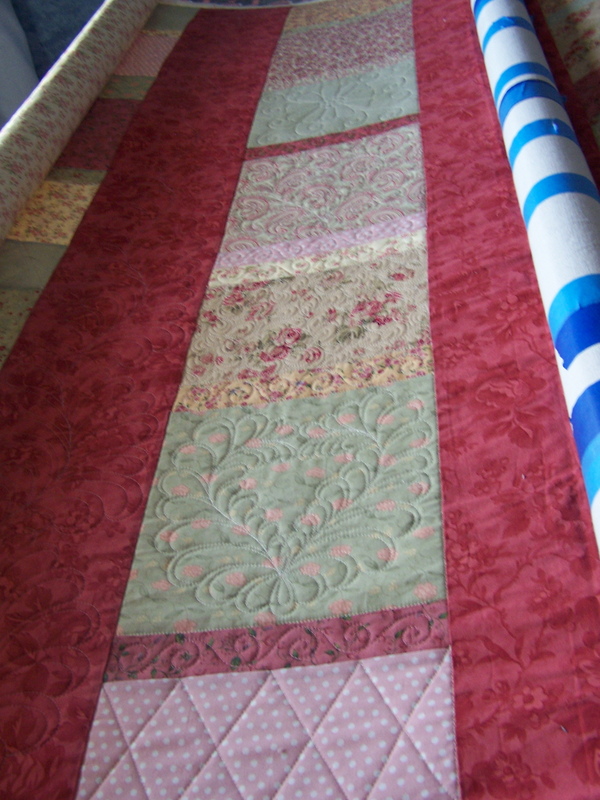 There are a few blocks that I will use a darker thread in, the pinkish blocks, and the three long strips. 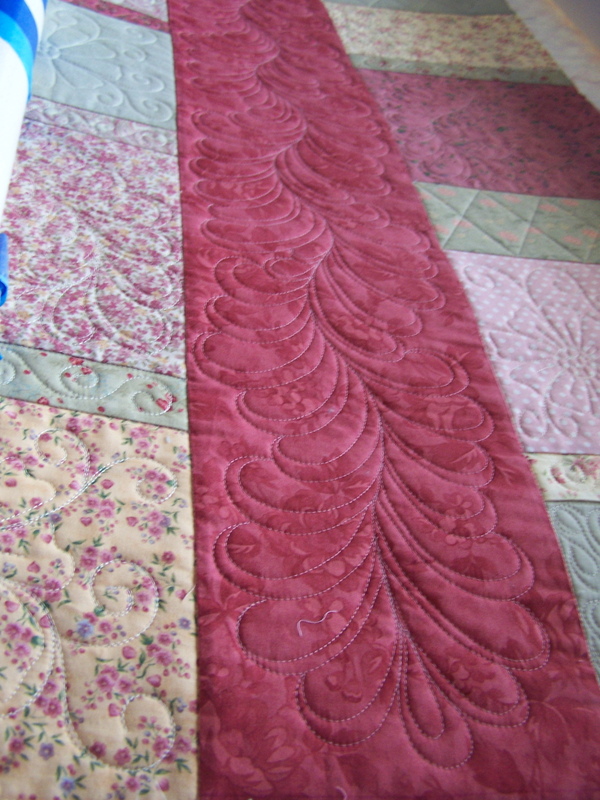 After I finish with the rest of the flowers, I will start quilting some feathered hearts, using a hook type feather in the remaining blocks, that measure 9.5″ square. It’s been going well and I’m anxious to see it unfold, so to speak. 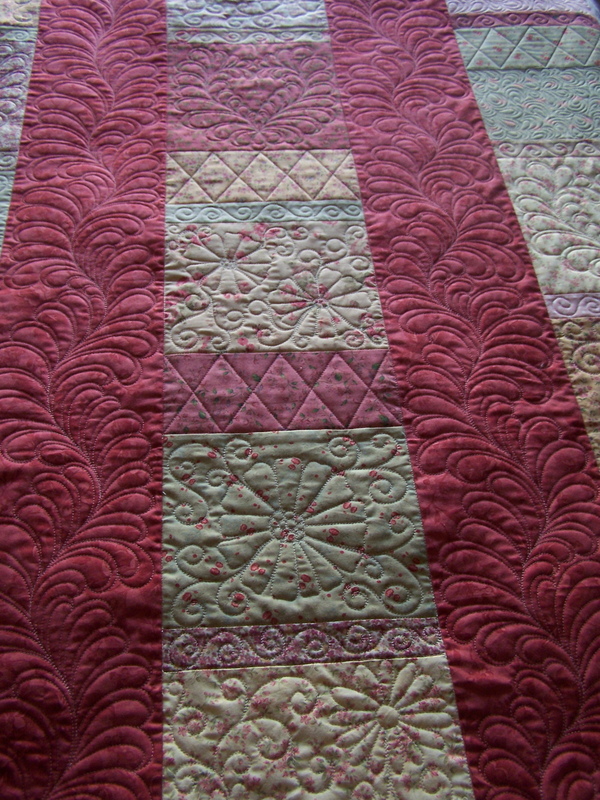 It’s fun watching the transition from unquilted to quilted. I never get tired of it. Enjoy your Saturday! Try to spend some time doing something you love! Outgoing Yardage to date: 12.25 yds. Total Stash Busted to date: 12.25 yds. I’m still going in the right direction. Yay! I said something about ordering some more thread yesterday, and my husband told me that he was planning on buying me thread for our anniversary, which is coming up March 1st. Yippee! A gift I will love and love using! 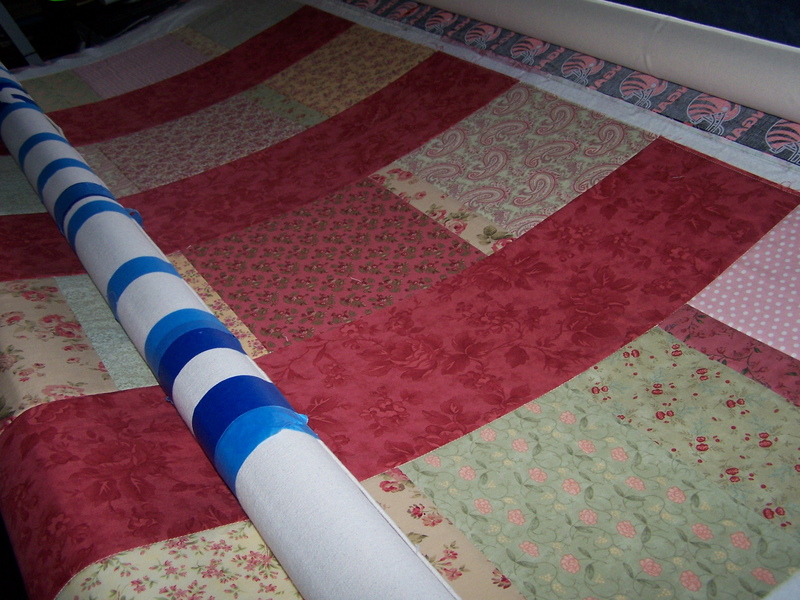 A longarm quilter, or any machine quilter for that matter, can’t have too much thread, now can they?! I’m sure looking forward to that shopping spree. Wow, January is just busy, busy so far. 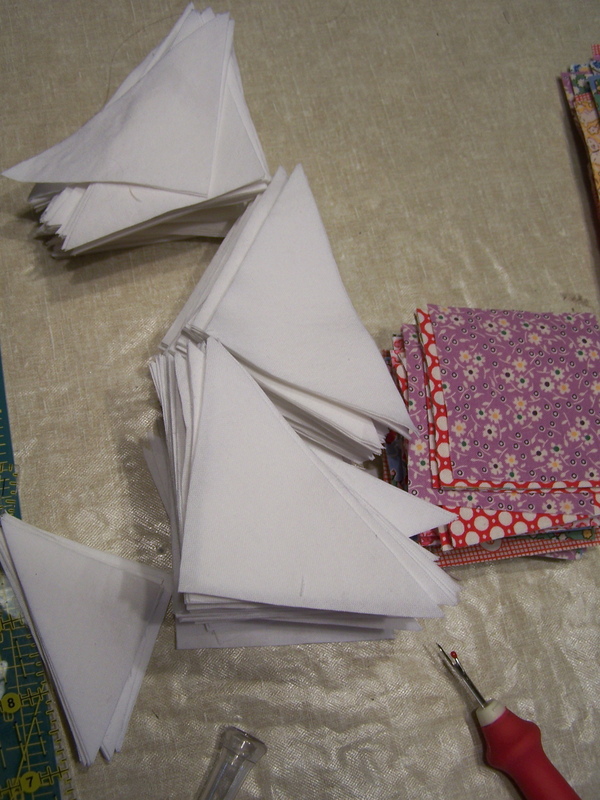 This week I had quilt guild Tuesday night. I’ve also been working on end of year tax stuff. Fun, fun, fun. I typed all our W-2’s, only to discover I was checking a box I didn’t need to check, and now I am about to go retype them. I need to balance the company check book, and do the sales tax filing for December. Of course, we have to get everything together for our accountant. My son has not had anymore hives breakout since Sunday. Yay! But now, I swear, I am coming down with something again. Sheesh, how many times can I catch this crap in a three month span. But the nasal stuffiness and scratchy throat feeling is back. I’m crossing my fingers it’s the crazy weather, and I’m not really getting sick again. Yesterday we were in the 50’s, today at 1:00 we had only reached 20. It’s FREEZING cold out. But, I think it’s supposed to be a short cold blast, and back to 50’s. 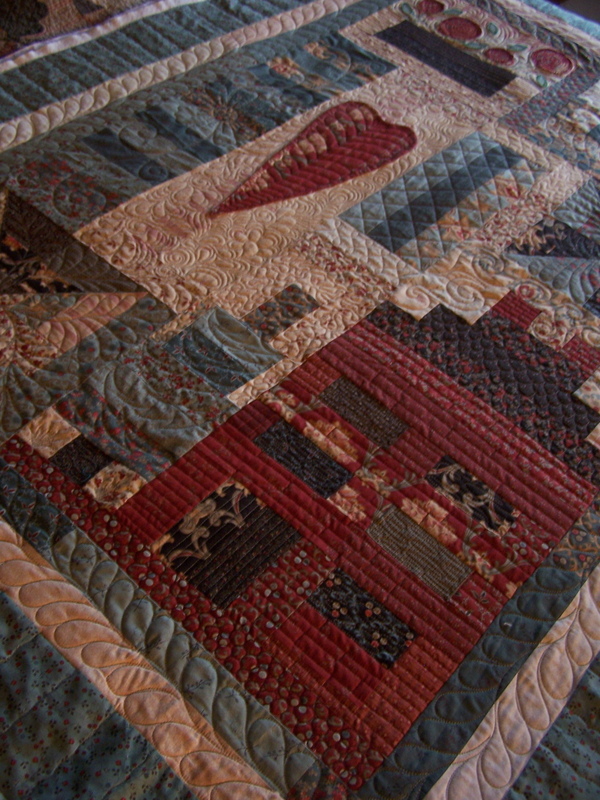 I finished the quilting on this one. Not the greatest pics. I couldn’t get really good light today. 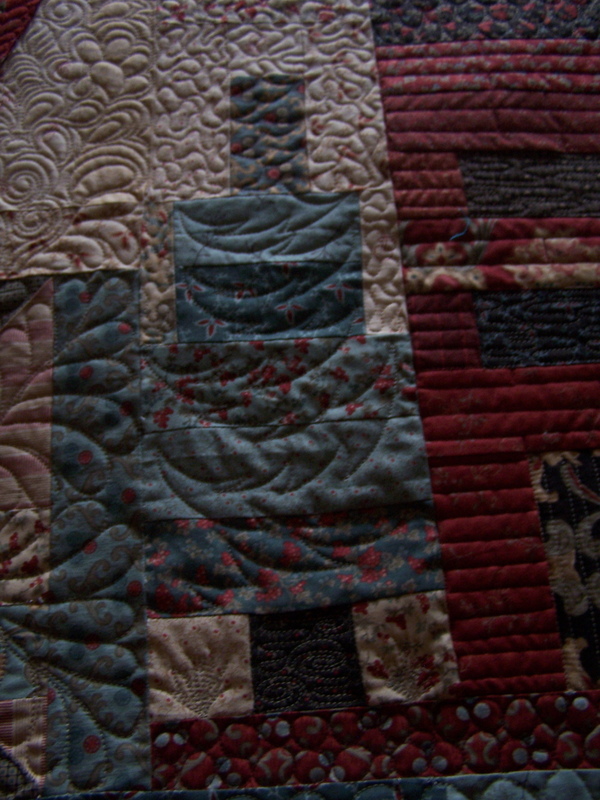 It’s a cute, fun quilt, and I thought it needed fun, cute quilting. I sure hope you like it, Betty! 🙂 Thanks for letting me quilt for you!